Driving home from work the other night this was my thought process: Ugh, we have nothing to eat. I guess I’ll pick something up…. But what? Wait, really?…. I just went to the store on Sunday and spent $108, how could we have nothing to eat? We have squash… probably an onion hiding in the pantry… and I bought that ginormous tub of spinach. Surely I can make something. But do I want to? Not really. It’s cold. I do want to go home. OK, fine I’ll go home and cook. I get home, crack open my laptop and type my two star ingredients into Google. Several recipes popped up. Risotto… no. Pasta… yes, I have that. OK. I can make something here…. I read a few more to get some ideas and did a little mash up of a few different ones to create something of my own. The end result which took only about 30 minutes to get to, was way better (and cheaper) than whatever else I would have picked up on my way home. The hubs was a fan too (even though it was sans meat). Why am I telling you all of this? Because I think we’ve all been there. Be it at age 8 or at age 58, you open the fridge, stare blankly for a minute, close it and say “there’s nothing to eat.” It’s just too easy to order a pizza or pick up take out despite having a fridge full of fresh ingredients at home. But when the hard part is done, there really is nothing like a home cooked meal that’s delicious, you know what’s in it, and you made yourself. Most of the time, it’s worth it and hopefully appreciated. Heat olive oil in a large pan over medium heat. Add garlic and saute 30 seconds. Add chopped onion and saute until translucent (about 5-6 minutes). In a separate pot bring salted water to a boil. Go back to the skillet and when the onion is slightly browning, add squash and stir. Add chicken broth and simmer until broth is absorbed and squash is tender (10-15 minutes). Now go back to your pot for the pasta. Add pasta to boiling water and cook according to package instructions. Check the squash after 10 minutes, if tender, add spinach and stir. Continue cooking until spinach is wilted, about a minute. When pasta is done, drain, rinse and add to pan. Stir to combine. 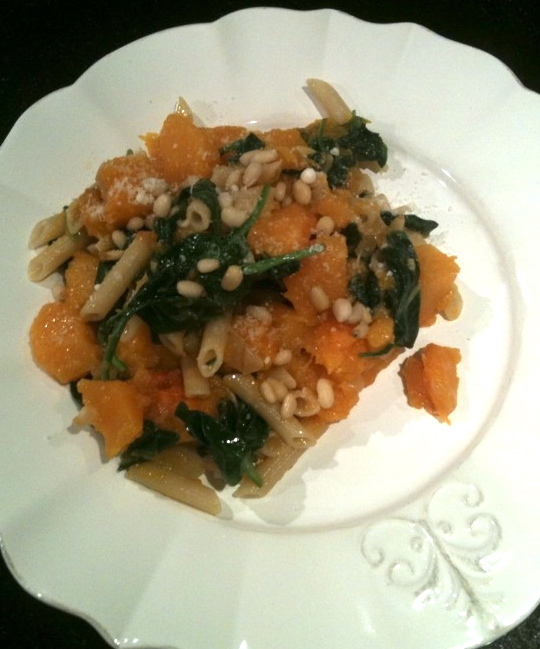 Serve and top with pine nuts and cheese (optional). Previous postWant to Learn to Cook?